Heavy duty .063 guage aluminum Notice Keep Door Closed sign with pre drilled holes for easy installation, and rounded corners for safety. Gun Safety First Aluminum Sign | 12" x 18"
Keep your workplace safe and in order with quality aluminum notice signs. This notice sign reads "Notice: Keep Door Closed" and will help keep staff and visitors in the know about your workplace or campus rules. 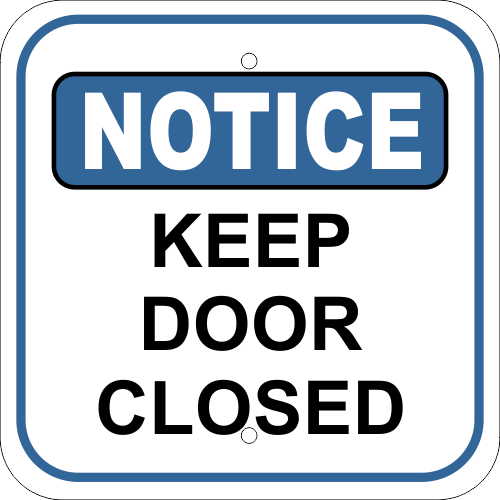 This Notice Keep Door Closed sign measures 12 by 12 inches, features 2 pre drilled holes for hanging and has rounded corners. Made of heavy duty .063 aluminum.